24 Jumbo Figure by Gentle Giant. This listing is for a 2014. 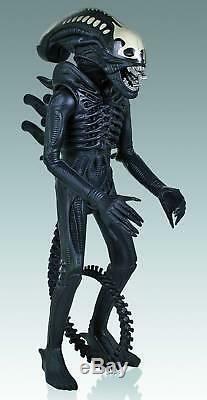 Gentle Giant ALIEN Jumbo 24 action figure. 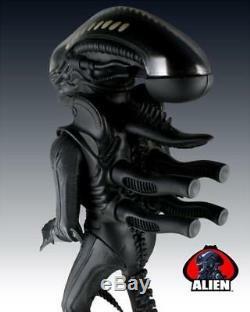 Not long after its release, the 1979 science-fiction/horror film ALIEN, in which a highly aggressive extraterrestrial creature stalks and kills the crew of a space freighter, was given a brief stint as a massive 18 tall action figure. Giger's psycho-sexual biomechanical star beast outraged a number of parent's groups who were incensed at the idea of toys from R-rated movies being marketed to their children. Gentle Giant has revived this figure for the collector's market by taking digital scans of the original vintage Kenner Alien figure and then reproducing it at a much larger scale. It also comes with an oversized reproduction of the original package art. 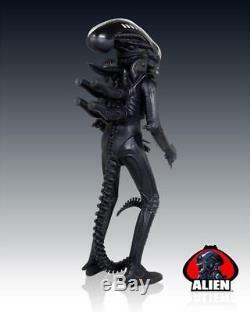 The design might look familiar as it is the 18 Kenner Alien figure (from way back in 1979) blown up to 24. It also has mechanically-activated jaws that open so that disgusting second mouth can pop out. We love it, but it's still disgusting. You can squeeze a trigger under the back of its head to activate it. 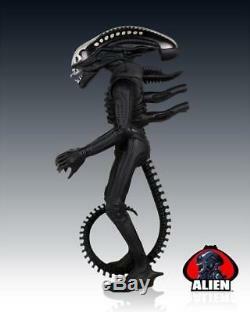 Is proud to bring you another piece of toy history with our Alien Jumbo Kenner-inspired Figure! As seen on Toy Hunter, Gentle Giant Ltd. Has taken an original 18 Kenner Alien figure and rescaled it to a staggering 24 inches! 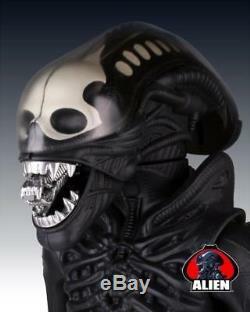 This gargantuan new Jumbo figure possesses the same features as the original from the chrome teeth to the clear dome head and glow-in-the-dark skull. No detail has been overlooked. This enormous figure even features mechanically-activated jaws, just like the original! Packed in an Alien-inspired vintage-style box with copies of the original poster and instruction sheets, the Alien Kenner-inspired Jumbo Figure is a must-have for toy hunters from all generations! 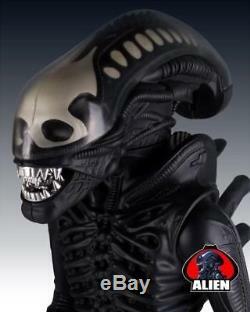 Features chrome teeth, a clear dome head and glow-in-the-dark skull. Packed in an Alien-inspired vintage-style box. Includes copies of the original poster and instruction sheets. In the original movie Kane makes the mistake of closely examining an Alien egg and is immediately incapacitated when the Facehugger emerges and crashes through the faceplate of Kanes space helmet. Against Ripleys strident refusal, Kane is brought aboard the Nostromo. It is later established that the Facehugger cannot be forcibly removed without killing Kane and/or causing the Facehugger to bleed acid capable of penetrating the Nostromos hull. The creature later reemerges in the form of the Chestburster, tearing its way out of Kane and slithering out of reach. In the dank recesses of the Nostromo the Chestburster evolves into the fearsome Xenomorph, a black, skeletal, insectoid biped looming above the Nostromos crewmen, striking from myriad claustrophobic shadows to ambush and kill each crew member. 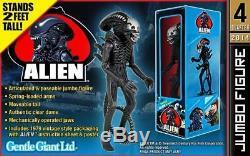 We will pack this 24 Jumbo Alien very carefully to prevent any damage from occurring to this figure before it gets to the person purchasing this item. Good luck in all of your auctions! The item "Gentle Giant 2014 24 ALIEN Vintage Jumbo Action Figure Factory Sealed in Box" is in sale since Wednesday, November 14, 2018. This item is in the category "Toys & Hobbies\Action Figures\TV, Movie & Video Games". The seller is "toymaniac" and is located in Grand Rapids, Michigan.